So I'm thinking of getting a slip on can as funds wont stretch to a full system just yet. All the pics of exhausts I have seen attach by a link pipe behind the cat and the exhaust valve. Some companies mention the need for a servo eliminator. Is it necessary to remove the servo as I cant see the valve getting in the way of the slip on or affecting its use. I'm not opposed to disconnecting / removing the servo but don't want to buy unnecessary parts as money is tight at the moment. Advice please. Cheers. Thought that may be the case. What are the pro and cons for leaving it as it is compared to removing / disconnecting the servo? Truth be known, you don't even need the servo buddy, just disconnect and remove the cables, a fault code will be stored but it won't throw a light, so unless you use a GS-911 or Motoscan, you'll never know the difference. The valve is spring loaded "open" and will stay open once the cables are removed. It won't sound much different as most of the "mufflering" is done in the cat.. I don’t recall anyone posting about the pros and cons so give it a go and post your findings. 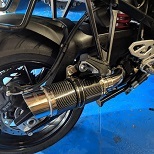 Hmmm, not sure if there are any tbh, I believe the valve is there to allow the bike to conform with noise emissions laws, some believe it enhances low-end torque, I've not noticed any lack of low-end since fitting headers and losing the valve though. So I bought the slip on and fitted it the other day, a Delkevic 200mm carbon / stainless one. Easy to remove the stock can and fit this. Sounds well with the baffle removed and the pops and bangs on the over run are very loud. Hopefully I will get chance for a blast this afternoon if I can drag my arse out of bed in time after the nightshift. Oooooo nice any pics? Think you will go for a full system once developed? I may just do that if funds are available. Will post a pic soon. Not the best pic but I wasn't planning on posting it here. Will take a better one next time I get chance.